Trübner was born in Heidelberg. He was the third son of a silver- and goldsmith, Johann Georg Trübner, and his wife Anna Maria. In 1867 he began training as a goldsmith in Hanau, and met classicist painter Anselm Feuerbach who encouraged him to study painting. In that year he began studies at the Kunstschule in Karlsruhe under Karl Friedrich Schick. He was influenced by artists he met in Karlsruhe, such as Hans Canon and Feodor Dietz. In 1869 he began studying at the Kunstacademie in Munich, where he was greatly impressed by an international exhibition of paintings by Leibl and Gustave Courbet. Courbet visited Munich in 1869, not only exhibiting his work but demonstrating his alla prima method of working quickly from nature in public performances. This had an immediate impact on many of the city's young artists, who found Courbet's approach an invigorating alternative to the shopworn academic tradition. In 1870 he made the acquaintance of Carl Schuch and Albert Lang. In August 1871, the three artists painted landscapes together during hikes in Hohenschwangau and Bernried, where they met Leibl. In 1872 Trübner met Hans Thoma, another German painter who greatly admired the unsentimental realism of Wilhelm Leibl. Together Trübner, Schuch, Lang, and Thoma formed the core of the group of artists known as the "Leibl circle". The early 1870s were a period of discovery for Trübner. He travelled to Italy, Holland and Belgium, and in Paris encountered the art of Manet, whose influence can be seen in the spontaneous yet restrained style of Trübner's portraits and landscapes. According to art historian Eberhard Ruhmer, "Trübner reached his relatively brief artistic peak between 1872 and 1876, during which time he made some of the most important contributions to the Leibl circle’s achievement and produced the most effective examples of what he called 'purist painting'"—paintings in which formal concerns take precedence over subject. His works of this period, such as Carpenters on the Banks of Wessling Lake (1876), depict prosaic scenes with a somber realism and subdued color. 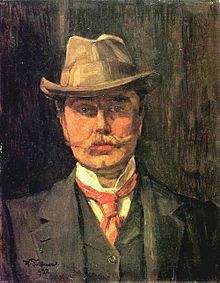 Subsequently, Trübner attempted to achieve greater success by brightening his palette, and he frequently painted historical and literary subjects. ^ a b c d e Bahns et al. 1994, p. 73. ^ a b c Ruhmer, E. (2003, January 01). "Trübner, (Heinrich) Wilhelm". Grove Art Online. ^ Forster-Hahn et al. 2001, p. 154. ^ Bahns et al. 1994, p. 76. ^ Bahns et al. 1994, pp. 76–77. Wikimedia Commons has media related to Wilhelm Trübner. This page was last edited on 24 February 2019, at 06:42 (UTC).